LEDs (in whatever form) convert electricity into light. The revolutionary thing about them is that they are a much more efficient light source then all lights that came before it. Sadly, they still aren’t 100% efficient in converting energy to light. During the conversion, energy is lost and simply said all energy “lost” during the conversion process is converted into heat. If an LED is not properly cooled it can burn itself to death very quickly, left unchecked they can even reach temperatures where the LEDs start desoldering themselves from it’s board or strip! Most often the effect isn’t so sudden though and only surfaces over time. Most LED strip won’t show any visible symptoms that you are killing it, but without proper cooling or running it at low light output only, most often you actually are. The most clear symptoms is that an LED strip that has been running fine for a while (weeks/months) suddenly starts to lose LEDs, they either go dimmer, change color or fail all together. If too many LEDs fail, whole sections of the LED strip can fail or even the whole strip. LEDs often have ratings of 20.000 hours or even 50.000 hours but those are only true if cooled properly. Heat is the number 1 cause of LEDs dying! 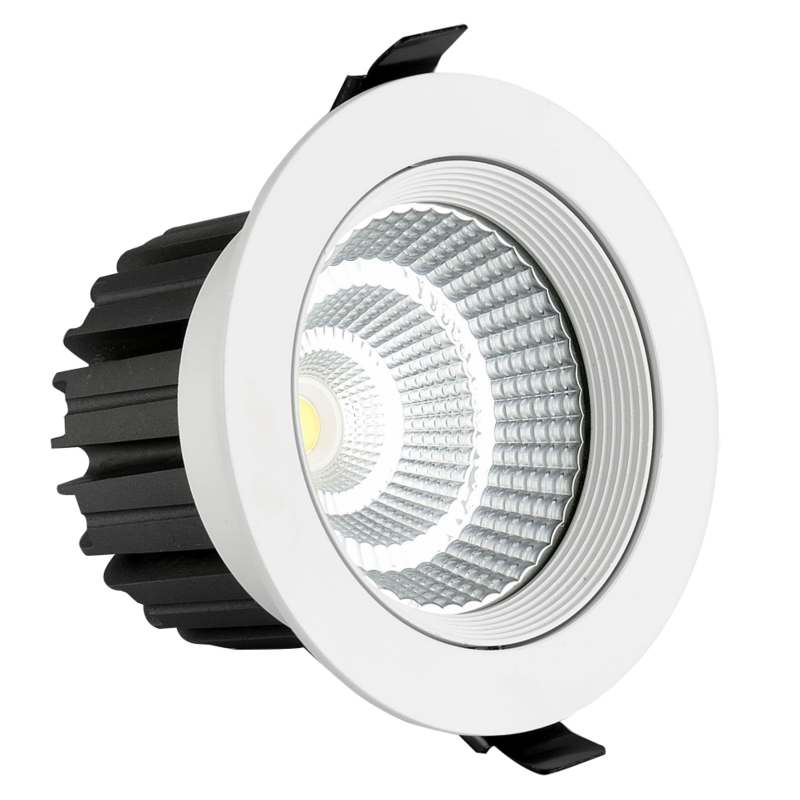 A prime example of LEDs needing cooling is LED cob lights in ceiling downlights. Not a lot of people buy these COB LEDs in their bare form so they come inside of a light fixture with a big heatsink attached to the back! So for that category of lights, most often you’re good. LED strip are made from flexible plastic PCB’s with copper traces put on top of it. The LEDs are then soldered to the channels on the LED strip and that’s basically it. Just like any other LED it needs cooling when run at high power. Although the strip can provide a very little amount of cooling through it’s copper traces it’s not enough to run the LEDs at full power for more than a few minutes at a time and even then, you are drastically lowering their life span. That basically means that wherever you are going to use LED strip you either need to make sure you are cooling the LEDs in some shape or form or don’t run them anywhere near their maximum power rating (Let’s say below 25%). Running them at lower power levels using a dimmer works but most often you have the dimmer because you run the LEDs at different intensities at certain points, so betting on that isn’t a good choice most of the time. LED strips come with glue on the back which lets you attach the strip to a surface. This glue has a double purpose though and next to allowing you to attach it to a surface it also insulated the back part of the LED strip from shorting out on metal. This is important, because sticking it to metal, often aluminium is the way you cool LED strips! That way the metal can absorb or “sink” away the heat from the LED packages and dissipate that heat over a much larger surface area then the LEDs have on their own. So we’re going to need some aluminium profiles in which you mount the LED strip! You can then mount these profiles in the places you need them and because they have a much bigger mass then the LED strips themselves they will run much cooler and won’t die as fast. Purpose made aluminium profiles also have the advantage that they come with plastic covers you can get in transparent, semi-transparent or “milky” variants which will act as a diffuser for the light, giving it a much better spread and preventing the forming of individual shadows from the individual LEDs on the strip. 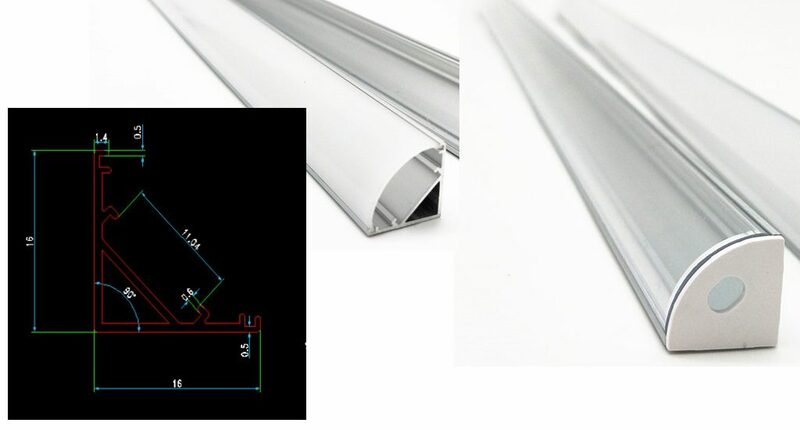 Most LED strip had a width of 10mm or 1cm, this is important because your LED strip needs to fit inside of the channel of the aluminium profile. These profiles often come in 0.5 meter or 1 meter lengths but I have also bought 2.5m single pieces before. It all depends on your needs and where you source them. 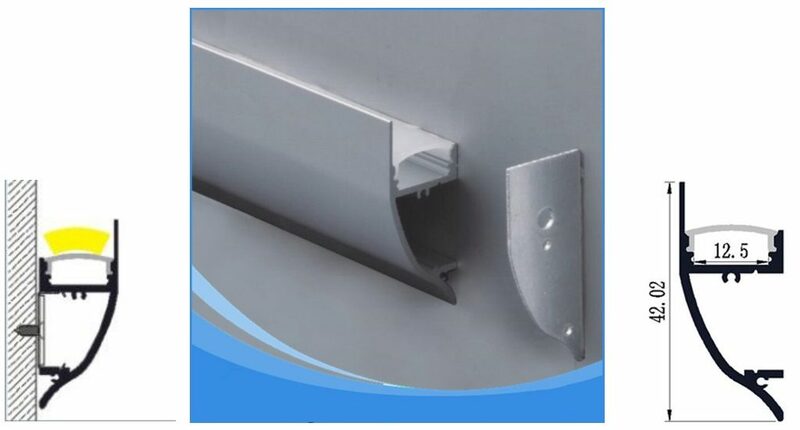 These profiles also allow you to mount the LED strip within a surface or at angle angle for instance, let’s take a look at some examples of these profiles. Can be used in a closet or cupboard but can also be integrated into a surface such as wood! Here are also some links to physically higher LED profiles(Link1 & Link2), the extra height adds some extra diffusion making the individual LEDs harder to see and proving a generally more pleasant light, especially when the LED light can be seen directly. The most used profiles for LED strip. Provides adequate cooling, nice diffusion and often gives you the ability to mount LED strip without looking directly into it! A wall profile is meant to be made on to a wall to either shine up or down without you being able to look at the LED strip directly. It just looks like a pretty aluminium strip that emits light! It also creates a very nice light pattern over your wall. 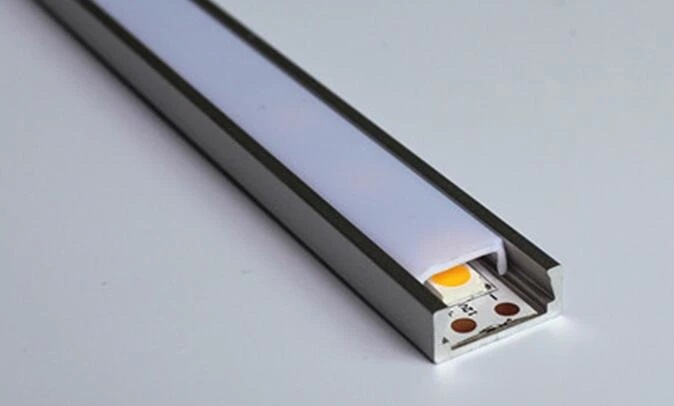 Although your LED strip will work just fine without any extra cooling measures such as these aluminium profiles, you will start to see the effects of not using one after a while, could be weeks, could be months but it’s a fact that heat shortens the lifetime of LEDs exponentially. So if you are doing an install or project that needs to last for a while and is going to use the LEDs at their full brightness, investing in some aluminium profiles can be a good decision!